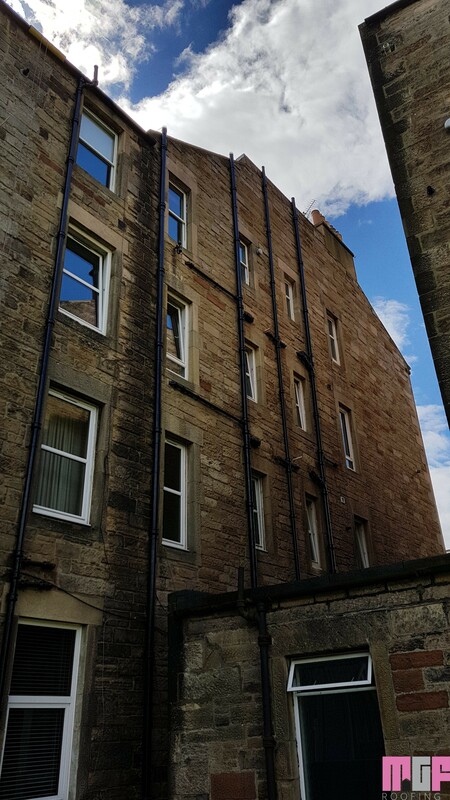 Guttering is often a part of our building that is very easy to overlook. Without regular maintenance including Gutter cleaning and gutter maintenance such as painting and regular condition checks on general condition, problems may arise from gutters not functioning correctly. 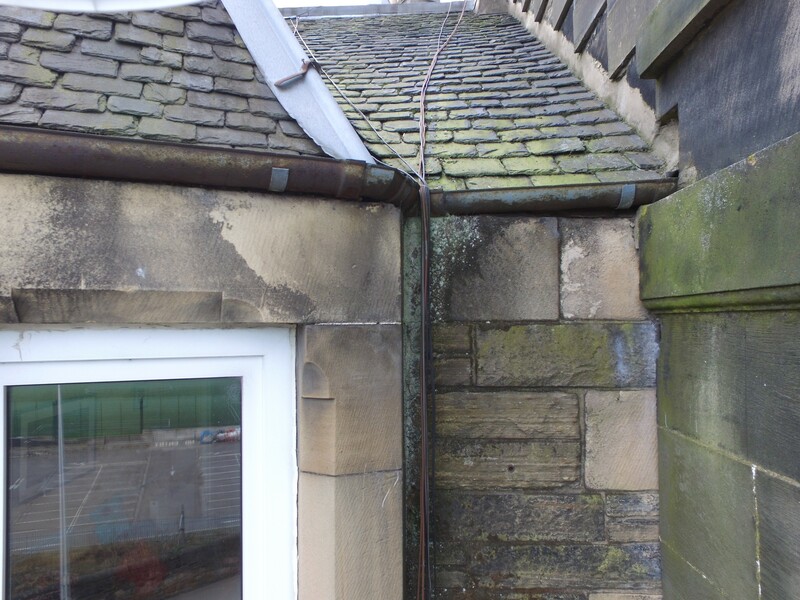 Cast iron guttering is very robust and should last for decades providing the maintenance is upheld. 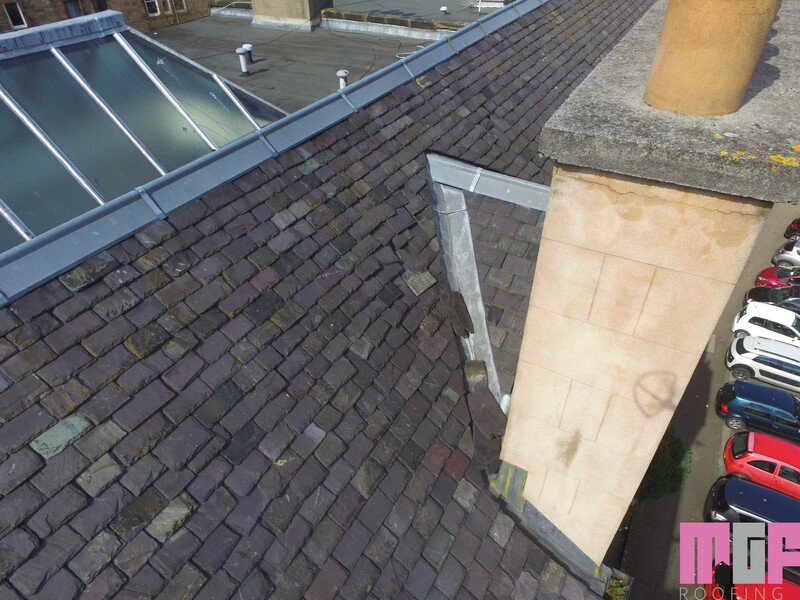 MGF roofing offer cost effective maintenance and gutter cleaning options using rope access techniques. 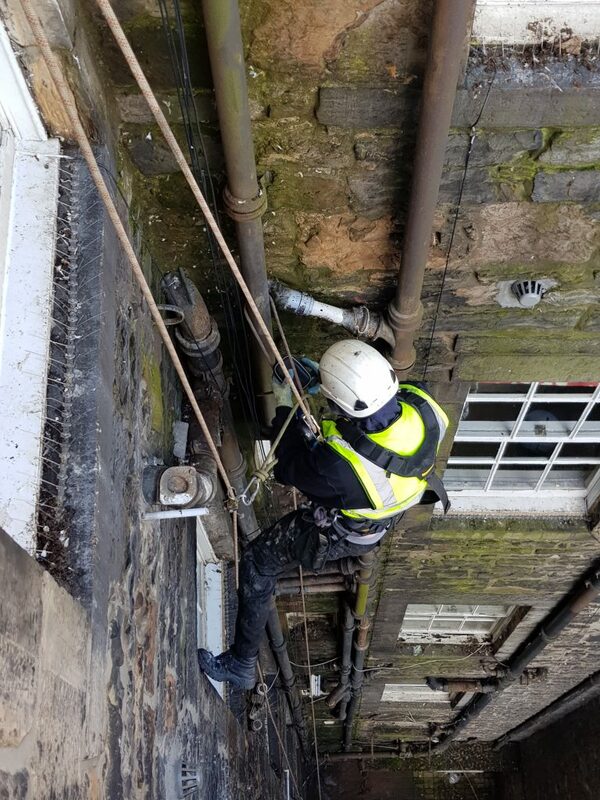 Our rope access technicians can carry out gutter cleaning, gutter replacements and inspections. Eliminating the need for scaffolding and other access methods. drastically reducing cost and duration of the work. We have compiled a brief list of common gutter problems. 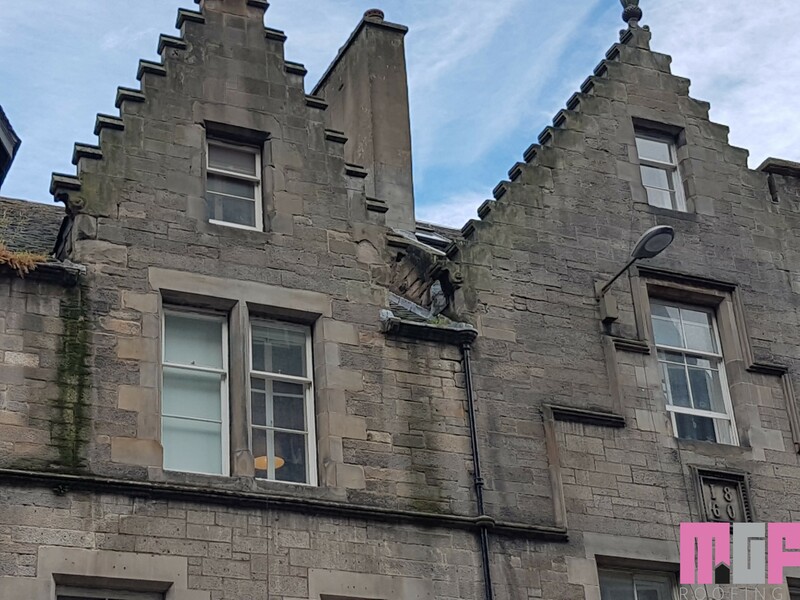 Lack of regular maintenance – Many gutter problems can be attributed to the deterioration of cast iron guttering. 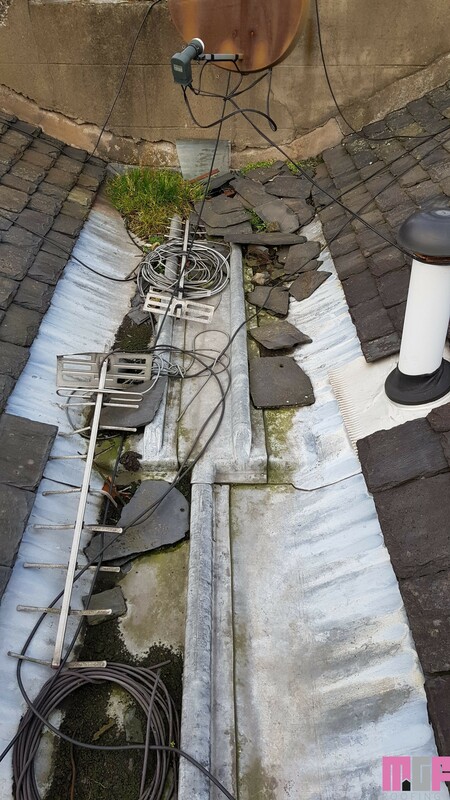 The inaccessibility and the downgraded importance people often place on regular gutter maintenance means they are not regularly inspected. 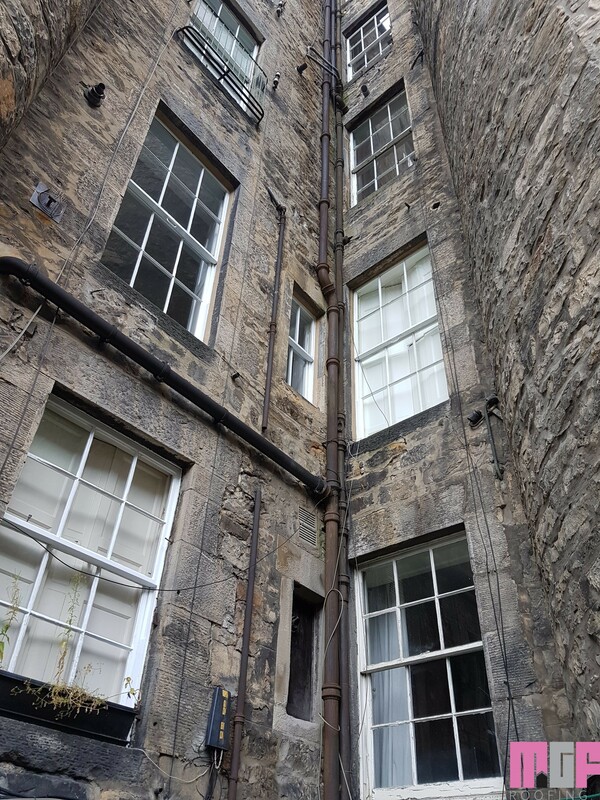 This is this particularly true in the case of tenement buildings with shared ownership as residents can be reluctant to agree on their importance and restricted access height usually means high costs associated. This is something that our rope access services reduce significantly. 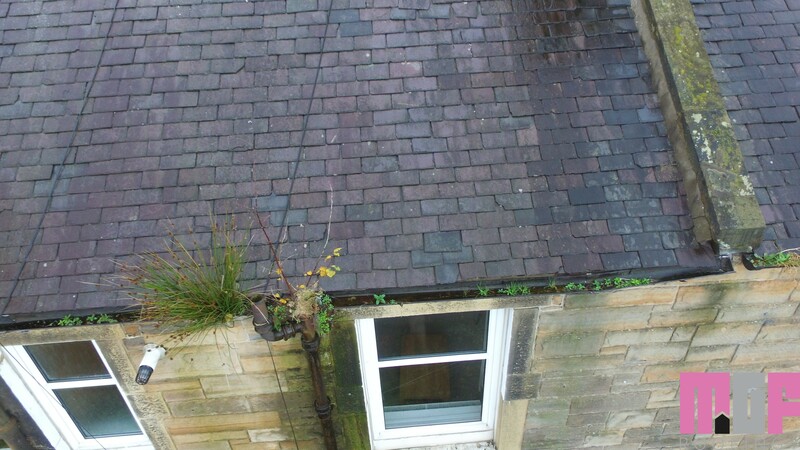 Blockages and vegetation growth – By far the most common cause of the reduction of gutter function. A build-up of leaves and other debris can block gutters, downpipes, gullies and drains. 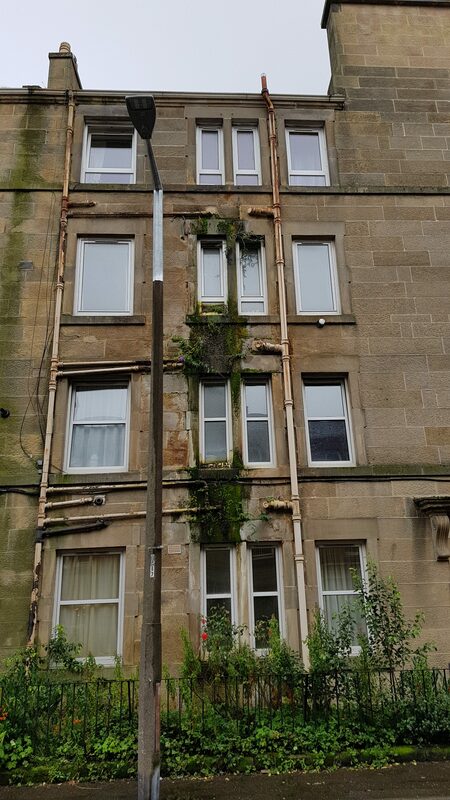 Left unattended, water can overflow and leaking into the building through the roof space or saturating the external walls causing damp. 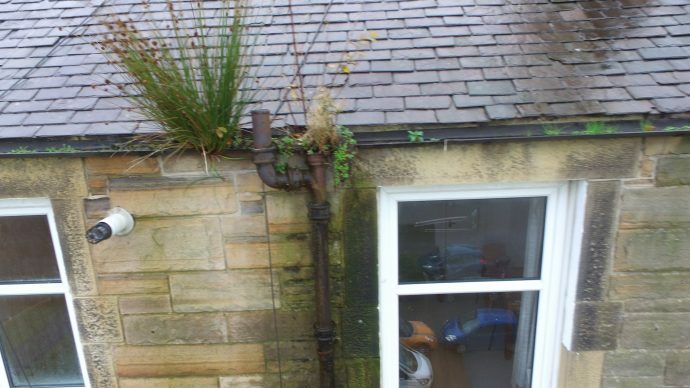 Blockages to downpipes and drains can cause flooding at the base of walls, often resulting in rising damp. This can also explain a mysterious new internal damp patches interternally on mid-level floor levels. This excess of water also encourages the growth of vegetation, which further blocks and impedes the discharge of collected rainwater. It is important to clear out the entire rainwater system to remove trapped debris on a regular basis. 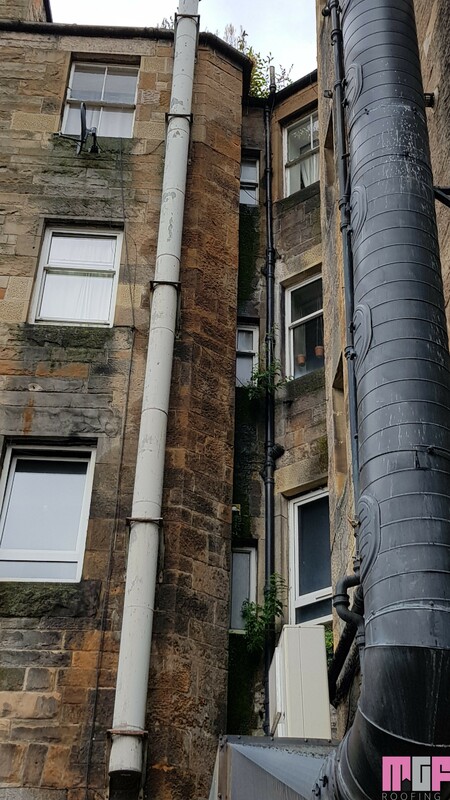 Fractures – Trapped water from vegetation and debris can freeze to such an extent that it can fracture cast iron downpipes and gutters. On thawing, the running water will seep through the fracture. Corrosion – Infrequent painting or incorrect painting will allow cast iron to corrode as this coating breaks down over time. This hugely reduces the lifespan of cast iron guttering if left untreated. Badly sealed, leaking joints are particularly prone to further corrosion and deterioration. preventing serious problems from arising. Annual inspections should be planned. Any problems, such as emerging leaks and overflows, might only be visible during heavy rainfall. Any signs of leaks or water ingress should be immediately investigated, and the cause identified and remedied. Vegetation, leaves and debris should be regularly cleared out from rainwater goods. Misalignment of components – The misalignment of components, such as broken sections of drainpipes or gutters, eliminates their effectiveness. This can be caused by the incorrect fitment of collars and drive in spike. or these items may have become loose over time. 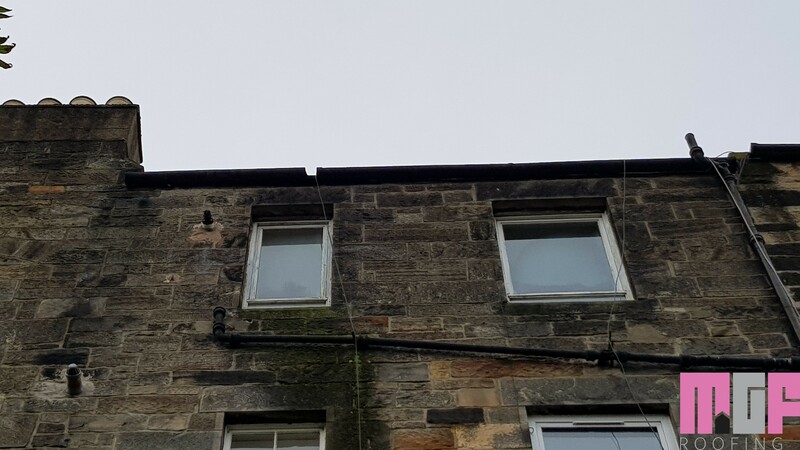 Supporting gutter brackets (or rhone hooks) have been lost or bent, they should be replaced before the gutter sections become dislodged and damaged. this is particularly common during heavy snowfall. 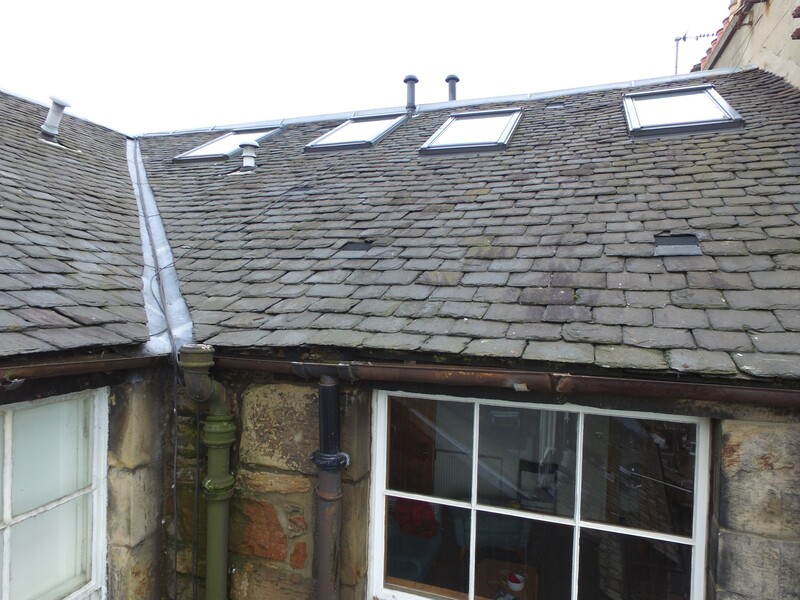 Guttering should be periodically painted, ensuring coverage of paint over all areas. Never paint over rust; the surface should be clean and free from corrosion, dirt and grease. 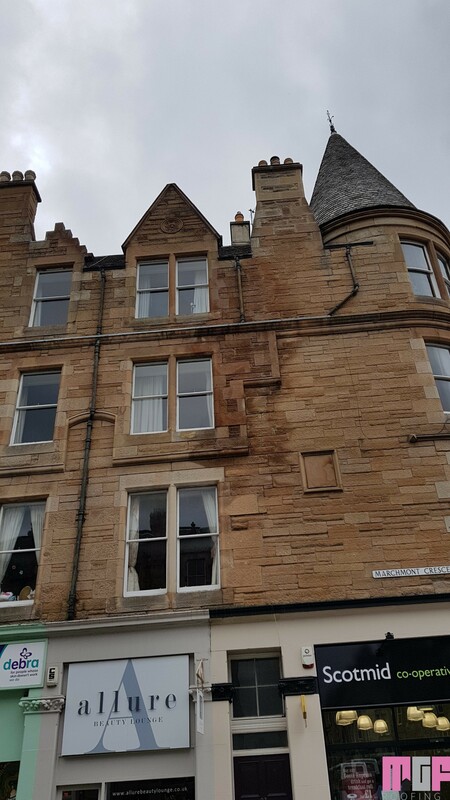 Cast iron guttering that is suffering from minor corrosion, but which are otherwise sound, should have all their rust removed prior to being re-painted. Existing sound paint should be keyed (roughened up with sandpaper) prior to new paint being applied. Any defective gutter joints should be re-sealed. With correct care and attention, there is no reason why surviving cast iron gutters will not last decades. making cast iron one of the most cost-effective whole of life gutter systems still available.